A limited number of national currencies play international roles. Internationalization offers a policy tool, a country’s own money that can potentially be used in global affairs to promote national goals. Currency statecraft refers to a government’s management of its monetary instrument. In principle, a broad menu of policy options is available. The central question is: What accounts for the policy choices that we observe in actual practice? A review of recent experience, going back to the end of World War II, suggests a cognitive explanation. Beyond matters of purely material benefits or costs, it appears, currency policy is motivated by deeper psychological considerations having to do with a nation’s underlying norms and priorities; in short, its distinctive sense of identity as channeled by political elites. At issue, in particular, is the extent of a society’s geopolitical ambition – how driven it is to build or sustain a prominent role in the community of nations. A credible theory of currency statecraft must be set in this wider ideational context, where the choices of government officials are grounded in the community’s most fundamental values and goals. Professor Benjamin J Cohen is the Louis G. Lancaster Professor of International Political Economy at UCSB, where he has been a member of the Political Science and Economics Departments since 1991. His research interests address issues of international monetary and financial relations, including U.S. foreign economic policy, currency integration, sovereign debt, theories of economic imperialism, and the history of the discipline of international political economy. He is the author of sixteen books; the newest of which is the recently published Currency Statecraft: Monetary Rivalry and Geopolitical Ambition. Professor Cohen holds a doctorate degree in Economics from Columbia University, and has previously worked as a research economist at the Federal Reserve Bank of New York, and faculty positions at Princeton and the Fletcher School of Law and Diplomacy at Tufts University. The crash of 2008 and the subsequent worldwide failure to confront the neoliberal project have generated reactionary nationalism all over the world. Racism is a central component of this reaction: it is expressed in anti-immigrant politics, Islamophobia, anti-Semitism, Negrophobia, and anti-indigenism, among other forms. Reaction is intersectional: it not only exhumes white supremacism but revivifies assaults on workers, poor people, women, LGBT people, and the planet itself. These grim developments, however, do not go unchallenged. Reaction is always reacting TO something, and that something is the immense achievements of popular-democratic movements since WWII. Since the Great Recession of 2008 and especially since Trump’s election in 2016, Black movements, the struggle for immigrants’ rights, global and local feminisms, and resurgent opposition to against capitalism itself have threatened the neoliberal order in new ways. It is their accomplishment, our accomplishment, which we have forced the global regime to turn toward reaction. The fight against racism is a key dimension of this struggle; we see it everywhere. Focusing on global trajectories of race and racism, contemporary configurations of racialized experience, and the remarkable demonstrations of anti-racist solidarity occurring on a global scale, this talk concentrates on the current crisis and the new parameters of racial politics becoming visible today all around the world. To revise Gramsci on this matter: the old has not yet died, but the new is still being born. Howard Winant has been Professor of Sociology at UCSB since 2002, where he also holds affiliations with the Black Studies, Chicana/o Studies and Asian American Studies Departments. In 2009 he founded and directs the University of California Center for New Racial Studies, a multidisciplinary program active on all ten UC campuses which works to network and support new approaches to research on race, racism and racial justice. Professor Winant holds a doctorate in Sociology from UC Santa Cruz, and has worked and taught in the US, Mexico, Brazil and Argentina. Professor Winant’s research interests include racial and social theory, and the comparative historical sociology, political sociology, and cultural sociology of race, in the US and further afield. His work on racial formation theory with Professor Michael Omi is considered seminal in the field of racial studies in contemporary US society. Edward Telles, director of the multinational collaborative research initiative Project on Ethnicity and Race in Latin America (PERLA), explains that profound historical and political forces, including multiculturalism, have helped to shape the formation of ethnic identities and the nature of social relations within and across nations. Based on PERLA surveys for eight countries, Telles will discuss how the region’s profoundly social and economic inequality is at least as much a function of skin color as of ethno-racial identification. Edward Telles has been a Distinguished Professor of Sociology at UCSB since 2015, where he also holds an affiliation to the Global Studies Department. Professor Telles is a leading figure in the study of race and ethnicity in the Americas, with an emphasis on Brazil and Latin American societies. His research interests include comparative race and ethnicity, color and colorism, international immigration, survey methods, social demography, and immigrant integration. Professor Telles obtained his doctorate in Sociology from the University of Texas and has held previous faculty positions at Princeton and UCLA, as well as teaching and working in Brazil, including at the Ford Foundation in Rio de Janeiro. Ingrid Kofler is senior research fellow at the Center for Advanced Studies of Eurac Research (Italy). She holds a PhD in Sociology from Paris Descartes University and Roma Tre University (Italy). Her main research interests include globalization, social change, innovation and migration, as well as qualitative and quantitative social research methods and interdisciplinarity. Prior to joining Eurac Research, Ingrid was researcher and project manager at the institute “Apollis” (Italy) and assistant lecturer at University of Rennes, Paris Descartes and Evry (France). Seventeenth-century Chinese Christianity, or the “Learning of Heaven,” was not shaped solely by intellectual efforts and spiritual quests. It was also impacted by hegemonic claims and efforts at institutional control by both the Chinese and Christian sides. Many tensions remained unresolved between two large power systems, including their subordinate institutions: the globalizing Catholic Church and the Chinese state and society. For instance, ethnic identities and policies played an important (and understudied) role in Late Ming Christian community. The paper argues that particularly a combination of micro- and macro-historical perspectives can help us understand how large power systems impacted religious life on the ground. Dominic Sachsenmaier holds a chair professorship in “Modern China with a Special Emphasis on Global Historical Perspectives” at Göttingen University, Germany. Before coming to Göttingen in 2015, he held faculty positions at Jacobs University, Duke University as well as the University of California, Santa Barbara. Dominic Sachsenmaier is the president of the US-based Toynbee Prize Foundation and an elected member of the European Academy of Sciences and Arts. He is also one of the three editors of the book series Columbia Studies in International and Global History (Columbia UP). His most recent monograph is Global Entanglements of a Man Who Never Travelled: A Seventeenth-Century Chinese Christian and his Conflicted Worlds (Columbia University Press, 2018). The global South, understood as a shifting and historically constituted formation, is the site of myriad agencies that, from the standpoint of global governance, appear unsanctioned, parasitical, and disruptive. Yet, from southern perspectives, illicit and often illegal activities such as squatting, counterfeiting, and piracy appear necessary and valid ways of making a living, of gaining access to social mobility, and of carving out tenuous modes of participation. This talk will conceptualize the piratical as the realm of agencies that emerges in the gap between legality and legitimacy, and that generates its own, distinctive globalities. Bhaskar Sarkar is a Professor in the Film & Media Studies Department at UCSB, where he also holds affiliations with the Comparative Literature, East Asian Languages and Cultures, and History of Art and Architecture Departments. His research interests include risk and speculative media, post-colonial media theory, cultural theory, the political economy of global media, history and memory, and Asian cinema. He is the author of Mourning the Nation: Indian Cinema in the Wake of Partition (Duke University Press, 2009) which critically explores cinematic traces of a particular historical trauma, and has coedited the collections Documentary Testimonies: Global Archives of Suffering (Routledge, 2009), and Asian Video Cultures: In the Penumbra of the Global (Duke University Press, 2017). The idea that China will try and change the world more to its liking as soon as it has the chance (and power) to do so has adherents from both those who welcome a challenge to the status quo and those who fear it. There might not be any clear understanding of what this reformed world might look like, or a clearly identified Chinese reform agenda. But the idea that we are on track to some sort of inevitable transition to a post-western era or Chinese led global governance has nevertheless garnered supporters. A historical review shows that China has actually moved a long way from relative isolation and rejection of Western dominated institutions of global governance, to becoming an active member of many of them. It has been more prepared to change and align itself with the status quo than the international order has been prepared to change to accommodate Chinese interests (or reflect Chinese power). 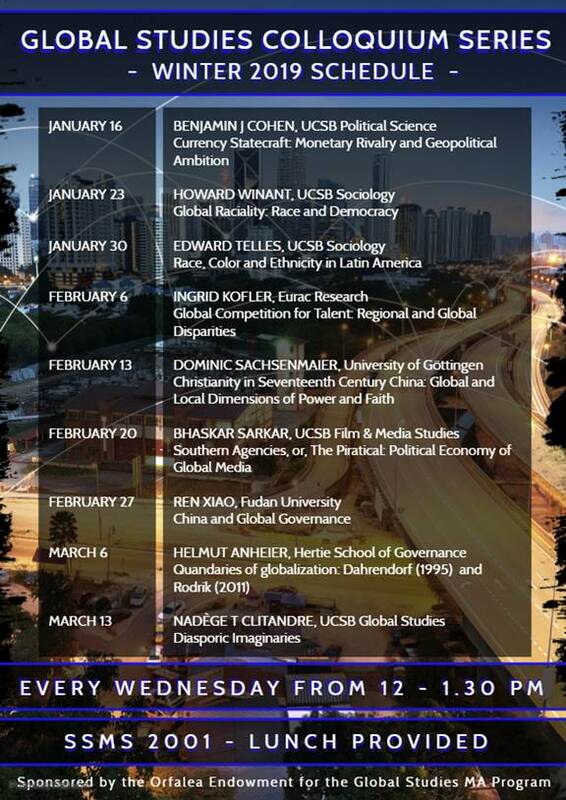 This talk will offer a Chinese perspective on the role of China in global governance. Ren Xiao is Professor of International Politics and Director of the Center for the Study of Chinese Foreign Policy, both at the Institute of International Studies at Fudan University in Shanghai. In partnership with China’s Ministry of Foreign Affairs, he founded the Diplomat-in-Residence Program at Fudan, the first of its kind in a Chinese institution of higher education. Professor Ren received his PhD in Political Science from Fudan and has held visiting faculty positions at universities in Finland, Japan and the US. Professor Ren has also worked as the Director of the Asia Pacific Studies Department at the Shanghai Institute for International Studies, and as First Secretary at the Chinese Embassy in Tokyo. His publications include New Frontiers in China’s Foreign Relations (co-editor, Lexington Books, 2011) and China’s Foreign Aid: Theory and Practice (2017). His research interests include international political theory, international relations of the Asia-Pacific, Northeast Asian security, and Chinese foreign policy. During the height of the 1990s globalization spurt, Ralf Dahrendorf (1995) argued that a growing world economy creates “perverse choices” for liberal democracies: staying competitive requires either adopting measures detrimental to the cohesion of civil society, or restricting civil liberties and political participation. For OECD countries, the task ahead for the early 21st century, he writes, “is to square the circle between growth, social cohesion and political freedom.” This challenge became known as the Dahrendorf Quandary (Buti and Pichelmann 2017). Writing after the 2008/9 financial crisis, Dani Rodrik (2011) suggested a version of the quandary, the Rodrik Trilemma. Phrased as an impossibility theorem, it posits that “that democracy, national sovereignty and global economic integration are mutually incompatible: we can combine any two of the three, but never have all three simultaneously and in full.” It seems that Dahrendorf and Rodrik have pointed to the fundamental challenge of modern Western societies, the incompatibility of the underlying drivers involved and the asynchrony of the ensuing processes. The economic drivers of globalization undermine the nation state, hence national sovereignty, and in turn, democracy through loss of legitimacy. Nativist economic strategies may strengthen the national state, even democracy, but lessen economic growth. Inherent are grave dangers, be they left or right populism mixed with identity politics, as Rodrik suggests, or, as Dahrendorf put it, authoritarian temptations and divided societies. The purpose of the paper is to examine the empirical foundations of Dahrendorf´s and Rodrik´s propositions and their implications. Helmut K. Anheier is Professor of Sociology at the Hertie School of Governance, and Adjunct Professor at UCLA´s Luskins School of Public Affairs. He served as President of the Hertie School from 2009 to 2018. His research centers on indicator systems, governance, culture, philanthropy, and organizational studies. Anheier is the principal academic lead of the Hertie School's annual Governance Report (Oxford University Press). He also holds a Chair of Sociology at Heidelberg University and serves as Academic Director of the Centre for Social Investment. He is the Academic Co-Director of the Dahrendorf Forum, a joint initiative by the Hertie School and the London School of Economics and Political Science. He received his PhD from Yale University in 1986, was a senior researcher at the Johns Hopkins University’s Institute for Policy Studies, Professor of Public Policy and Social Welfare at the UCLA Luskin School of Public Affairs, Centennial Professor at the London School of Economics and Political Science (LSE), and Professor of Sociology at Rutgers University. Anheier is author of over 450 publications, many in leading journals, and has received various international awards. Before embarking on an academic career, he served as Social Affairs Officer at the United Nations.